This tapestry "Terra Nova" is based on the work of US artist Elizabeth Jardine. She hails from the State University of New York and since a young child has been inspired by fine artists and master painters. She creates her own works filled with classic regality and harmonious use of color. 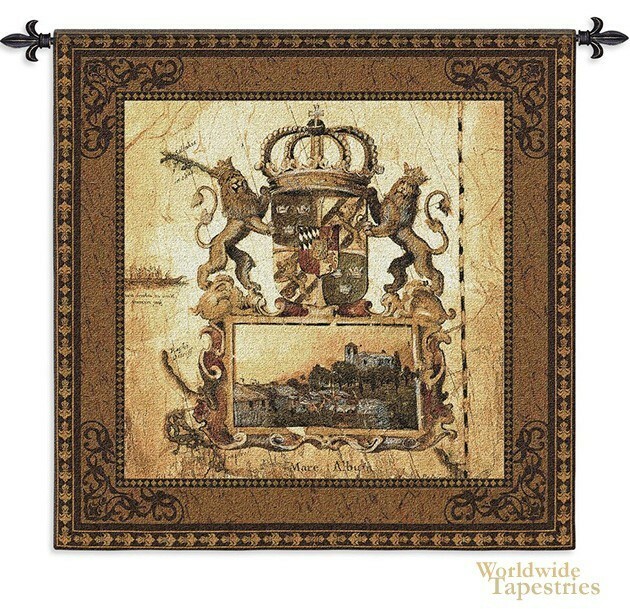 In this coat of arms tapestry, like it's companion "Nova Terra II" the crowned lions are flanking the main royal crest, under a scene of the Tuscan countryside, a homage to the Italian masters that she was inspired by. This tapestry has a lining and is backed with a tunnel for ease of hanging. Note: rod and tassels (where pictured) are not included.